92 • March 2018 • S I G N & D I G I T A L G R A P H I C S Product Highlights EXPERIEN CE THE NEXT GENERATION Premium Quality High Performance Highly Versatile CO 2 Laser Source HyperDual Motion Unmatched Safety K E R N L A S E R S . C O M 8 8 8 - 6 6 0 - 2 7 5 5 M A D E I N T H E U S A ShopBot manufactures professional grade CNC tools that won't break your bank. Own a full-size shop tool that delivers professional speed, power, and accuracy. ShopBot tools are great for an endless variety of cutting, drilling, and carving operations – and have the ability to do so in a variety of materials. 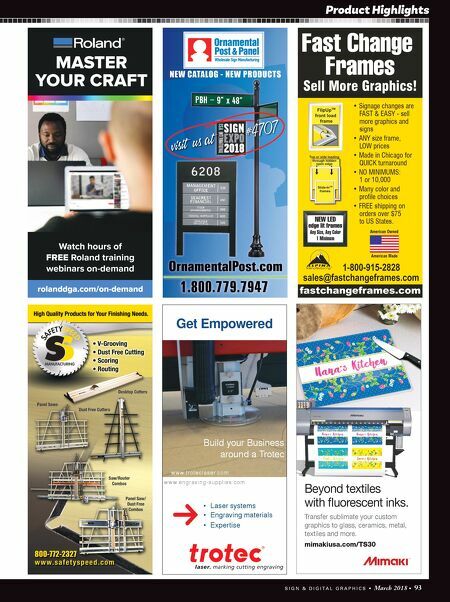 For full tool specs and pricing, visit our website. Then call us to order yours! 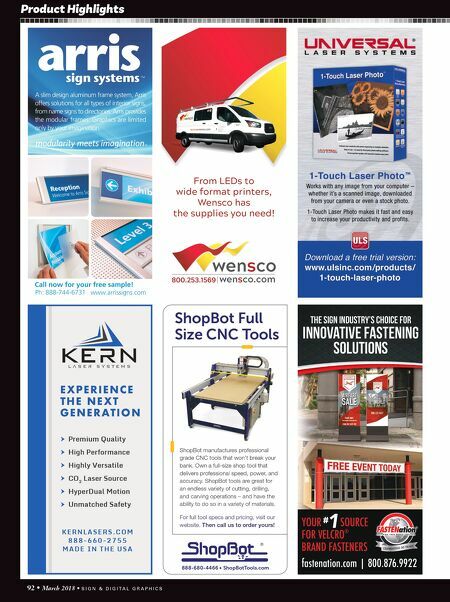 ShopBot Full Size CNC Tools ShopBotTools.com 888-680-4466 • From LEDs to wide format printers, Wensco has the supplies you need!